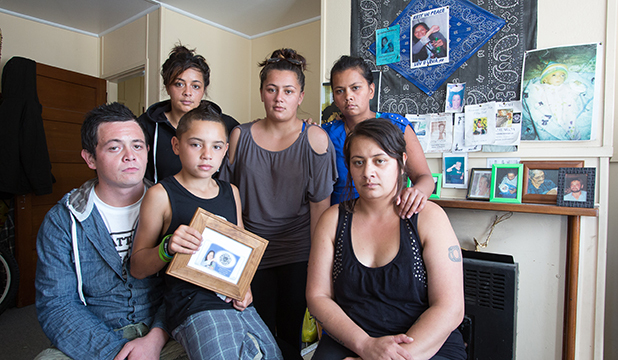 In November 2011, the Waiikato Times reported that a Hamilton woman died in prison of a heart condition after her calls for help were ignored by guards. An inquest into the death of Anna Selina Kingi, 41, at the Auckland Coroner’s Court heard that Ms Kingi was found dead in her cell at Auckland Regional Woman’s Facility (in 2008) more than an hour after she activated her alarm. She was mother of seven children (see photo) and grandmother of one and had been in prison for just under a month when she died. The inquest heard that Ms Kingi was scheduled to see a doctor the day before she died, but the doctor was too busy and did not see her. When she became distressed the next day (November 10, 2008), Ms Kingi pressed the emergency alarm in her cell but prison guards ignored the call. One guard, whose name was suppressed, said she heard the alarm, but was busy so she just asked through the intercom if Ms Kingi was alright. There was no answer. So she ignored it, did not send anyone to check, did not record the call and did not refer it to the incoming shift. A few minutes earlier, another guard who was supposed to visually check her cell, failed to do so. Three minutes before Ms Kingi pressed her cell alarm, she walked past Ms Kingi’s cell without looking in. She told police that rather than look in the cells, she fastened her digital ID to a broom handle, reached up and swiped the card over a sensor to make it look like she had done her rounds. Cardiologist Dr Jim Stewart told the inquest Ms Kingi died of hypertrophic cardiomyopathy – an inherited disorder that causes thickening of the heart, making it hard for the heart to pump blood. He said normally there was a lead-in tachycardia (rapid beating) when the disorder led to a fall in blood pressure. He said defibrillation or CPR could have worked if performed in the first five minutes after the alarm. When Ms Kingi’s body was discovered more than an hour later, it took 13 minutes to get the keys and open her cell. The inquest was told that at the time the prison had only one defibrillator and custodial staff could not have accessed it anyway. This story is typical of the quality of healthcare offered to prisoners. It is not dissimilar to the case of Justin Rys who also has a heart condition and has sleep apnoea. Mr Rys has to wear an oxygen mask while he sleeps – otherwise he stops breathing during the night placing additional stress on his heart. While Mr Rys was in Rimutaka prison on remand earlier this year, the machine which pumps the oxygen broke down. For two weeks, nursing staff ignored his pleas for help. It was only when his lawyer intervened that Mr Rys was taken to hospital and given a new oxygen pump. If it hadn’t been for his lawyer, My Rys might also have died in prison. Prison guards and nursing staff at Rimutaka clearly would not have cared. Anna is my cousin. Do these pricks get paid to do their job or what? At least one head should roll for this. I clearly remember, with horror, the screams of pain coming from a cell at Waikeria after lockdown (when women were housed there prior to the new facility opening at Wiri). She was suffering from kidney stones and the only contact she had during the entire night was a guard asking her if she was okay through the window and the obligatory, and now infamous, paracetamol being passed through the window to her. No doctor, no nurse…until the next morning when she was rushed to Waikato Hospital. I was horrified at the barbaric nature of the whole episode and hoped to hell I would never fall into that terribly frightening, lonely experience. Just another form of punishment…not too dissimilar to the way young unmarried mothers were made to suffer without pain relief during labour to teach them a lesson.